Using pet shampoos can be a great way of conditioning your animal’s coat and preventing the spread of pests including fleas and ticks. This is true of larger animals such as cats and dogs, but it is also true of smaller animals including hamsters, guinea pigs and rabbits. Long haired varieties particularly benefit from washing with a pet shampoo, and thankfully there are plenty of fantastic products available to cater for your – and your pets’ – needs. 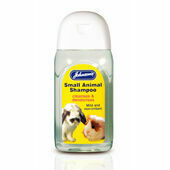 Please browse our range of pet shampoos to learn more about our conditioning products for small animals.